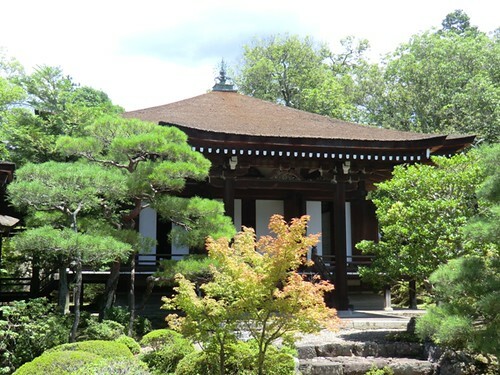 Ninna-ji has two tea houses, Hito-tei, which sits on manmade hill beyond the pond in the North Garden, and Ryokaku-tei which is surrounded by trees behind Remeiden. In winter when the trees have lost their leaves it will be much easier to see Ryokaku-tei than is it now, but if you peer between the tree branches from Remeiden, you should be able to catch a glimpse of it. Ryokaku-tei was originally the residence of the painter Ogata Korin (1658-1716) and was moved to Ninna-ji during the Tempo Era (1830-1844). When Ryokaku-tei was built, it was designed to resemble a famous tea house called Joan (joe-ahn). Joan was built in Kyoto in 1618 by Oda Uraku, tea master and the younger brother of the infamous Oda Nobunaga. The tea house was moved from Kyoto in the late Meiji period and came to its present location in Inuyama City, Aichi Prefecture in the 1970s. You can see a couple of pictures of Joan here. The buildings are really quite similar, but you know what they say — imitation is the sincerest form of flattery. 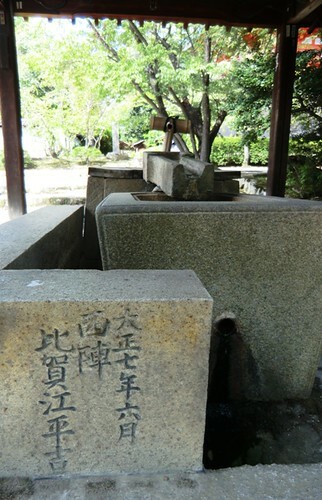 Many temples and shrines have a place for visitors to wash their hands and purify themselves before or during their visit. There is a wash basin here at Ninna-ji, but it is not necessary for guests to wash their hands. In fact, the basin showed to the left usually does not have running water. This basin is across from Daikoku-do and is covered by a roof that offers some nice shade. The words written into the stone that you see in the bottom left states the date the basic was completed and who made it. The date is June of Taisho 7 (1918). I’m not sure how to read the name, but he was from an area in Kyoto known as Nishijin. When you walk around Reimeiden, you will see this roofed shelf behind the building. 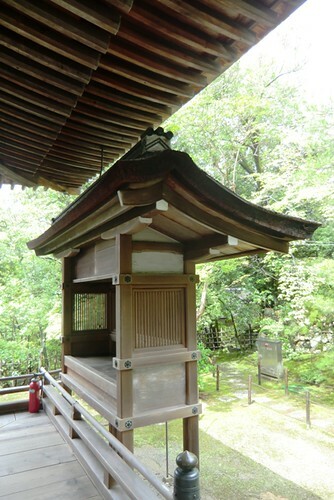 These structures are often found in temples near main buildings in inconspicuous locations. This type of shelf is known as an akadana in Japanese and provides space to change the water for cut flowers that decorate the altar within the main building. At Remeiden, the water can be taken from a well that sits just around the corner. The aka in akadana is spelled “閼伽” with Chinese characters. These are characters that were chosen for the word based on sound alone, the characters do not express the meaning of the word. Aka refers to water that is given as an offering, it could be translated as “holy water” in English. The popular belief is that this aka and “aqua” from Latin have the same etymology. There are beverages in Japan that start with “aqua” so while Latin may not be widely studied here, there is an understanding of “aqua” being related to liquid/ water. However, there is research that suggests that this popular belief is just folklore and that the two words are actually unrelated. How the belief that aka came from “aqua” came about I am not sure, but the simplicity of the explanation must be one reason it has stuck around even in the face of research to the contrary. The “sacred jewel” decoration on the roof of Reimeiden establishes this building as a worship hall. The present building was completed in 1890. There is a complete altar erected inside with the Medicine Buddha (Yakushi Nyorai) as the principle image. The original statue of the Medicine Buddha that was enshrined within Reimeiden was stored out of public view until it was analyzed in the 1980s to verify its age. In 1986 the statue was discovered to be very old recreation of an even older statue. It is believed that the original was destroyed in 1103, and the statue that remains at the temple to this day was completed over the span of one month during the same year, making the current statue over 900 years old. In 1990 the statue was declared a National Treasure of Japan, it holds the record as the smallest National Treasure at only 21.9cm tall including the halo and pedestal. Hito-tei was constructed during the Kansei Era (1789 – 1801), and is the oldest building in Goten at over 200 years old. The tea house underwent some repairs after the Hanshin Earthquake in 1995, but, unlike other structures in Goten, it has never needed to be rebuilt. The main room within Hito-tei is 4.5 tatami mats large (7.29m² or 23.9ft²) and the interior walls are finished with a thrown straw technique. 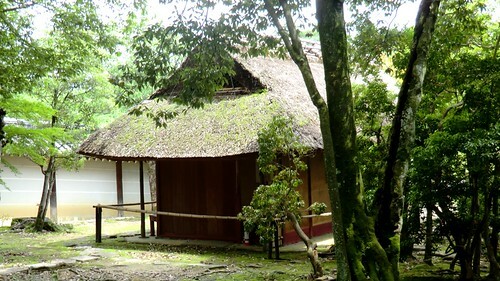 The building is covered by a gently curved grass-thatched roof. 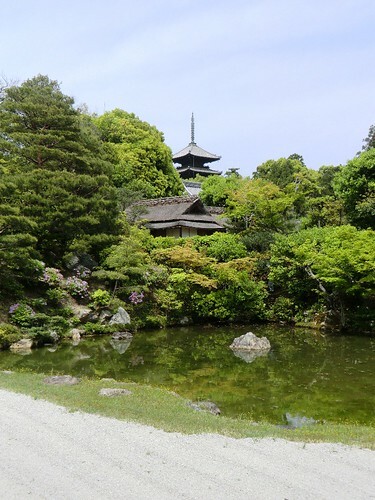 Hito-tei was a tea house frequented by members of the imperial family and was a favorite of Emperor Kokaku, the great-grandfather of Emperor Meiji. Tea houses normally have low entrances which require all guests to bow their heads as they enter the ceremony room, but Hito-tei is remarkable because it lacks this common feature. 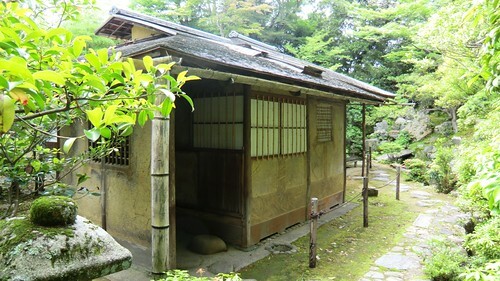 Due to the royal status of Hito-tei’s patrons, the entrance into the tea room is a “nobleman’s entrance,” a doorway tall enough to walk through without bow one’s head. The original Kannon-do was built in 951, but was lost to fire during the Onin War. The present building is a reconstruction from the 17th century. 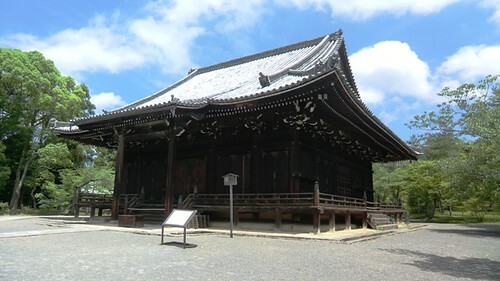 Kannon-do has a hip-and-gable roof covered in tiles, and is a rather tall structure for a building from the early Edo period. 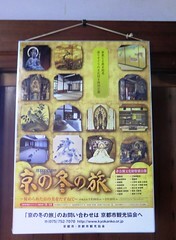 The principle image enshrined within Kannon-do is the Thousand-Armed Goddess of Mercy (Thousand-Armed Kannon) and the inside of the building is painted with colorful images of Buddhist deities. It is a little difficult to gauge the size of the building from this picture, but imagine a person standing next to the building with their head coming just over the height of the railing and it will give you a better idea of the size. Kannon-do is usually closed to visitors, but the next time it is open to the public you can expect a post about it on this blog! You have to be some distance away from the temple to get a view like this! 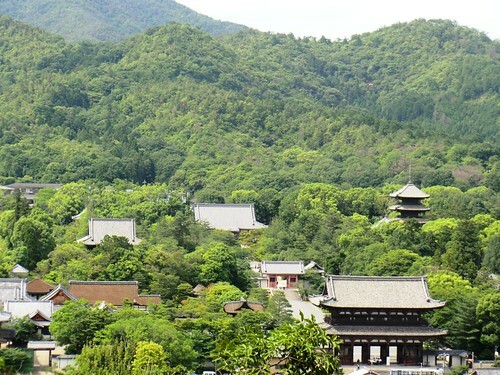 It is easy to see that Ninna-ji is truly at the base of a mountain in this picture. I’ve tagged several of the structures that appear in the photograph, see which buildings you can identify! There is a large copy available on Flickr, click the image to go to Flickr and download the larger size.